Review for The Ultimate Guide to Text and Phone Game, I'd Give This Product a 5 Star Rating. "I'd Give This Product a 5 Star Rating." Very simply put, you will learn a lot - it is packed with great information put in a very understandable and readable format. I'd give this product a 5 star rating. There was definately a hole out there for something like this, and although you can pick up bits and pieces by scouring forums and other products for days, why bother? It'll cost you 10 times more and take up 10 times more time. Plus, it wouldn't go into as much depth. On top of that, the price of the book ($99) would easily be justified just to read the one-liners and phone scripts that are put in there - they are all hilarious! There is a little overlap between the information (Dynamite theory) given in the E-Book and provided in the social circle mastery course, but that is fine - this product gives much more depth and lots of practical examples. 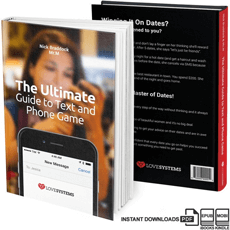 The book provides you with some excellent models to work with - from which you can move from initiating conversation again, building attraction and comfort, to finally getting the date. Again, book this is very very useful for understanding the principles. Whilst the book does cover phoning a girl, the primary focus is on texting in order to build compliance for her to take the phone call (about 80% of the book is to do with texting and theory, the other 20% is to do with the phone call). Don't see this as a weakness, as the book will definately help you meet with more girls, more often. Think about it - if this book helps you get one more date a month from now on into the future, the book is an absolute bargain at $99. Especially when you consider the amount of money you spent to go out and look good before you even get a phone number. Definately a "buy" recommendation here. Let's see you add some more social weaponry to your arsenal!